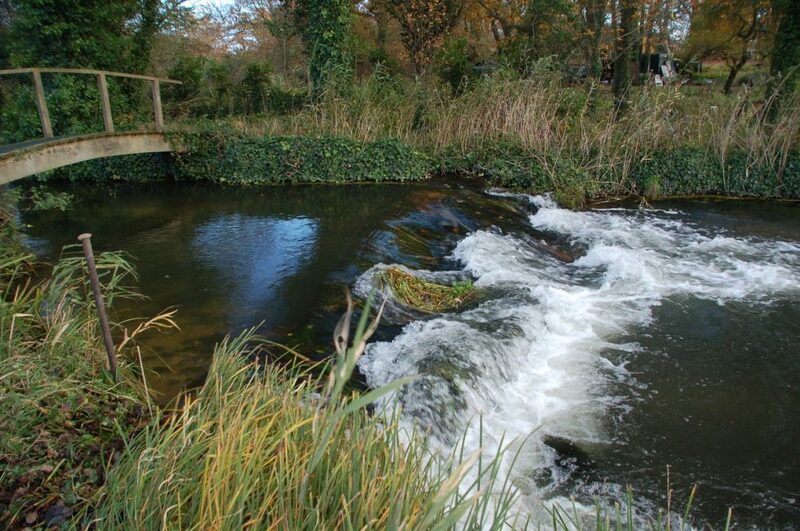 Wind the clock back to October 2008 and Cain Bio’s restoration team found themselves busy dismantling a fixed crest weir and live sewage pipe on a well known carrier of the River Test in Timsbury, Hampshire. Simon Cain had already been asked to look at the site some 10 years previously but his recommendation to demolish the weir wouldn’t come to fruition until the property changed hands in 2008. This scaffolding and concrete rubble weir was installed to protect a live sewage pipe suspended mid-stream across the Mayfly Carrier, Timsbury. The new owner, a keen fly fisherman with a leaning to wild salmon & trout conservation, asked Cain to draw up a restoration plan to remove the weir impoundment and re-route the suspended sewage pipe downstream and under the bed of the carrier. With the impoundment gone, the now over-wide but free-flowing channel was re-meandered using locally imported chalk, gravel and woody material from pollarded bankside Alders and Willow. On completion, the heavily impacted river bed was jet sprayed to remove years of sediment build up prior to a re-dressing with locally imported gravel. Six extensive salmon-spawning sites were created with imported gravel at key locations along the 300m reach. Although turbid late-winter flows were fining down at the time of this photo, at least 9 salmon redds were clearly visible in the shallow riffles. These were mostly located on the new gravels in areas that were previously slow flowing and buried in 500mm deep sediment..
Man-made impoundments of various kinds abound on rivers throughout the Uk. This scaffolding & board weir on Bossington Estate’s Old Station beat has now been removed as part of a habitat restoration scheme in October 2014. Immediately up-stream of the weir: These impoundments are especially damaging on low gradient chalk streams where man-made structures such as un-consented scaffolding board weirs can back up flows causing sedimentation and habitat degradation for considerable distances upstream. This image of a heavily-degraded, weed-free chalk carrier was taken only 5 metres upstream of the scaffolding weir shown above. Salmonids are genetically aligned with rheophilic environments. Any proposal to reinstate this fundamental habitat need must therefore focus on weir removal and the reinstatement of a free-flowing, ‘natural-process’ environment. If you own or are aware of such an impoundment, whether large or small and think there is an opportunity for similar habitat improvements do contact us. We would be pleased to arrange an advisory site visit. 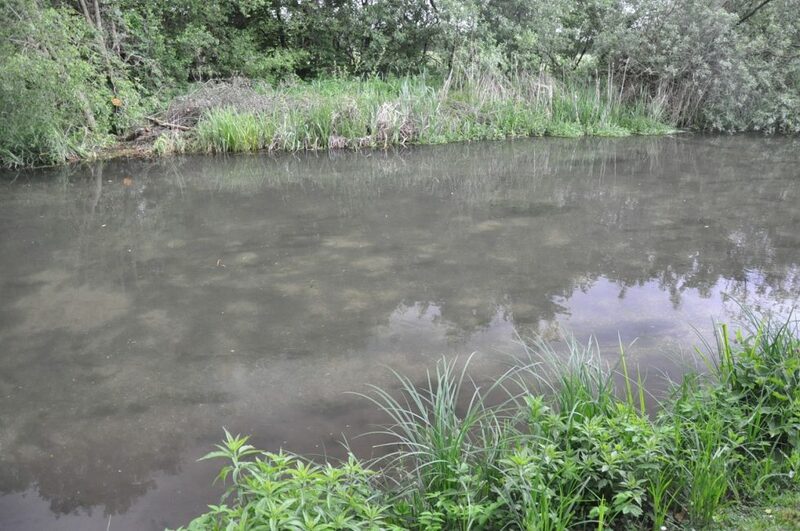 The Mayfly Carrier success story is but a drop in the ocean of degraded chalk stream habitats, but nevertheless an important case study in the quest to reverse a terminal decline in wild Test salmon stocks. 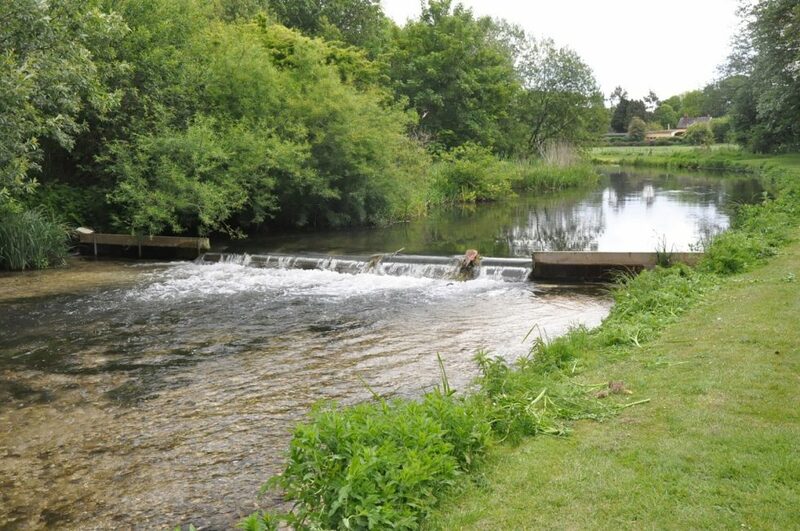 NB: One of Cain Bio’s major habitat restoration schemes involving the removal of an historic sluice impoundment was completed in 2010 on a 3km reach of the river Kennet. 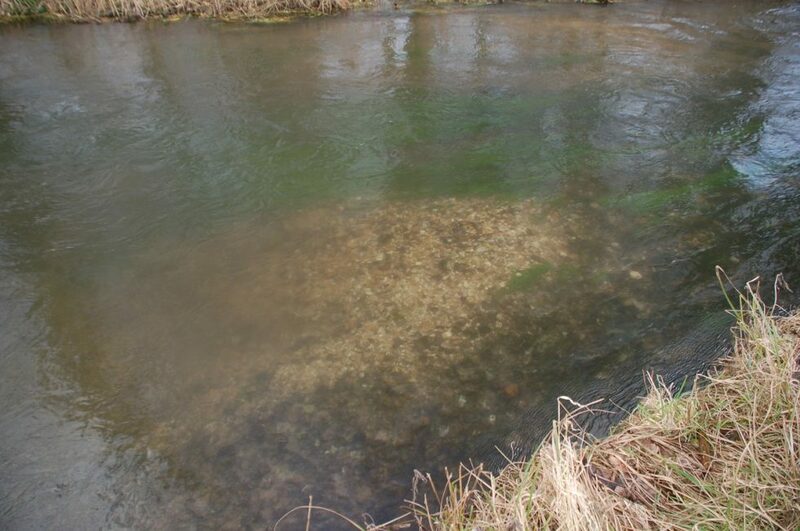 Another similar scheme was undertaken on a 2km reach of the Upper Hampshire Avon at Gunville Hatches, Wiltshire, during 2012. Both of these projects are scheduled for posting onto the site.